May 19, 1928 to November 10, 2014, passed away peacefully at Mapleview Nursing Home, Owen Sound. Loving husband of Maybelle (nee West) for 58 years. Loving father to Kandy (Al), Randy (Shelley), Cindy, and Angela (Wade). Special Poppa to Shawna (Brandon), Bobbi-Jo (Mike), Kara (Mike), David (Ashley), Timothy (Leslie), Bethany (Brandon), Ethan, Aidan, Mathew (Amanda). Poppa to 11 great-grandchildren. Brother-in-law to Wilda Hannah (late Ellis), Sharon Wright (late Harold, and Larry West (Donna). Survived by special nephews Rodney, Ryan, and Rylan. Predeceased by his parents George and Marie; sister Doris (late Jack); and brother Bill. 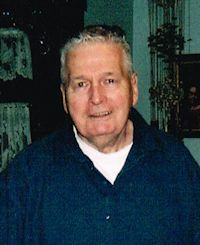 George was a long-time employee of Gateway Haven in Wiarton. Family invite you to gather with them for a service celebrating George’s life on Thursday, November 13, 2014 at 2 o’clock at the THOMAS C. WHITCROFT PENINSULA CHAPEL, 272 Berford St., Wiarton (519) 534-5341. Visitation from 1-2 pm. Interment in Bayview Cemetery, Wiarton. Donations to the Alzheimer Society, Mapleview Nursing Home, or the charity of your choice would be appreciated.